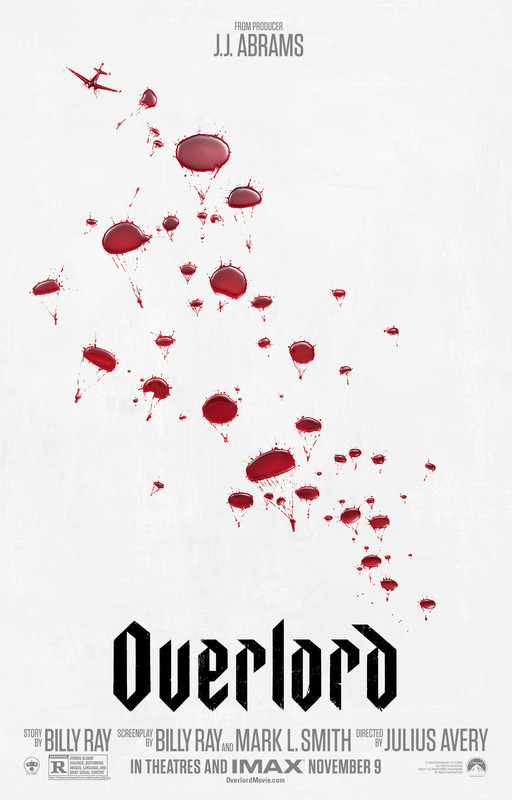 As a fan of World War II movies and zombies, Overlord seemed like a perfect fit. Finally someone was going to dig into the territory of games like Wolfenstein, the genre of sci-fi Nazi experiments with American soldiers going in to wipe them out. Alas, Overlord fell short of those wants and needs. It’s great looking movie with good special effects and CGI, but the key to all WWII films is the characters. The characters in Overlord are forgettable and shallow. Without anyone to care about, its horror aspects are all for show and lack the emotional hooks needed to draw you into the story. The main character of the movie is Boyce, played by Jovan Adepo who you may or may not recognize as he has mostly done TV work and only a couple movies. His character is averse to violence, but curious and goodly hearted. The movie defines him with a story of him literally not being able to kill a field mouse that was plaguing their camp in training. Of course eventually does end up killing the bad guys, but it’s not like a big turning point in the film. It just happens, and he’s a bit more heroic afterwards. He’s part of a squad of delinquent soldiers sent on a suicide mission to take out a radio tower the day before D-Day. Leading the squad is Kurt Russell’s son, Wyatt Russell, aka Ford. Ford is the tough guy who knows what he’s doing. His defining moment is torturing a German officer in order to get intel on the enemy outpost while Boyce tries to fight him to stop and loses. Ford is eventually redeemed and shown to be a good guy, but like all the other characters, there’s not enough investment to get the audience to bond with him. There’s a couple other characters in the squad, Tibbet the sniper who sounds like he’s from New York and talks too much, and Rosenfeld the quiet, reserved Jewish guy whose afraid of being captured by the Germans, plus Chase the out of place photographer. The unexpected addition to the squad is a local French girl who ends up helping them out in order to rescue her brother, Chloe, played by Mathilde Ollivier. And there’s the badguy, Pilou Asbæk, who is the German SS officer in the town. Now here’s the thing, the actors do a great job with their roles. As shallowly developed as they are, Boyce makes you feel his reluctance to commit violence or allow anyone else to do so needlessly. Ford exhumes his single minded focus on the mission and tough guy act. Chloe, probably the best developed character in the movie, does a good job of balancing who she should trust when their are dangers all around her. Plus Pilou, who plays Wafner, does a great job as the stuck up, gross abuse of power soldier, and later on as the super powered zombie soldier. And the story, which isn’t very deep, does provide a fun setup as they explore the creepy castle full of bad guys and weird zombie experiments. There’s a good horror element as they dive into that aspect of the film and it’s handled well. They really didn’t need to flesh out the origin of the experiments or explain what the Germans are doing as it’s pretty self-explanatory and not that important. But the way this film is built, everything hinges on the characters. If you’re not invested in them, then there’s no reason to care when they’re in danger, when they decided to do something dangerous, or when they die. I’m going to draw this out a bit as I think it’s important. Some people will go in and see this movie and enjoy it. I’ve heard people give very positive reviews of it. Thus, in a way, I’m trying to explore why I didn’t like the film. For me, it really does come down to the characters. In war films, they always strive to create some colorful characters you can get attached to. For example, there’s the classics like Kelly’s Heroes where you have the out of place hippy tank driver played by Donald Sutherland, the smart aleck played by Don Rickles, or the hero turned bank robber played by Clint Eastwood. Those are some big names but the roles they played wouldn’t have worked if the dialog wasn’t there. And it doesn’t have to be deep, intelligent dialog. The key is wit and relate ability. You have put some scenes in there and some dialog that gets the audience to relate to the characters and bond with them. Something that’ll make you laugh or smile or think “that’s badass” or “awesome.” With more modern war movies you have the ultimate example of Saving Private Ryan. Tom Hanks plays the captain with the weight of all his soldiers’ lives weighing on his shoulders. But there’s that little thing they do where everyone guesses what he did before the war. It’s a little thing that draws you in. You have Tom Sizemore, the dependable sergeant who collects dirt from every new country he visits. Then there’s Barry Pepper, the badass sniper who says a prayer before he takes his shots. They’re memorable characters created by a mixture of good acting, good writing and good directing. Sadly, the characters in Overlord lack the scenes and dialog that could have made them memorable. So, if you like zombies and World War II movies, should you go see Overlord? It’s got an 80% fresh rating on Rotten Tomatoes with a 76% audience score, so it seems like there are a lot of people who enjoyed it. But if you take my word for it, there’s no guarantee that it’ll work for you. Don’t expect great characters or historical accuracy. If you’re okay with some shallow developed characters shooting Nazis and zombies with great visuals and action, it just might pay off. Sadly, I have to give this one a two out of five metal bikinis.